« PHP – Writing to an Access .MDB database using a DSN-less connection. Early in 2005 we saw one of these in Guildford. Quite liking the design but unwilling to pay the price we decided not to buy it. After some pondering I decided that I’d like to have a go at making my own and given that I had a lot of the equipment necessary I knew I could do it for a fraction of the price. A face mask to cover your nose and mouth whilst sanding and planing. One or two sturdy work benches or else a couple of saw horses. Wood – I’m lucky enough to have a decent supplier of wood reasonably close to my home. I was able to pick up the wood in my own car (estate) and transport it myself. Remember that Oak of the sort you’ll buy is very heavy so make sure that the vehicle you use is adequate for the job. Make sure that there is enough room in the boot to fit the wood in the first place and that there aren’t any bits of trim that are likely to mark the wood. If you get deep marks in the wood it’ll just take you much longer to plane it down. Once you’ve got the wood at home leave it for a few weeks in the place that you intend to use to work on it, wether that be the garage or shed make sure its dry at least. Leaving the wood to become acclimatised to the rooms temperature means that it should be more stable while you are working on it (in terms of warping). 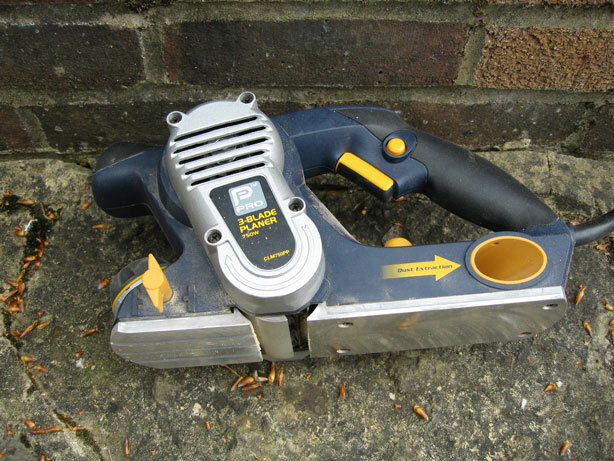 Saw – I’ve got a Spear & Jackson Predator 16 inch “second fix” cross-cut saw with 10 ppi. Whats PPI I hear you ask? Points per inch of course! Its similar to this. Basically anything that can cut wood and leave a fine finish will be good. Its a cross-cut saw because I’ll be cutting ACROSS the grain in the wood rather than with the grain. I bought mine from B&Q but rather unsurprisingly I can’t find it on their website, which is RUBBISH! …sorry whats that you said? What’s second fix? Oh for goodness sake if you need things spelling out for you…! Second Fix is a building construction stage when the dwelling is ready for fitting of finished goods (usually after plastering) –skirting boards, doors, lights, water cylinder, appliances etc. So a second fix saw is one designed for use on wood in that sort of arena, ahem, probably. Move along, stop asking questions! Saw Horses / Workbench – You’ll need something raised off the floor to do the cutting so if you don’t have them already get a couple of saw horses or some cheap workbenches (B&Q Workbench – £9.99 each). 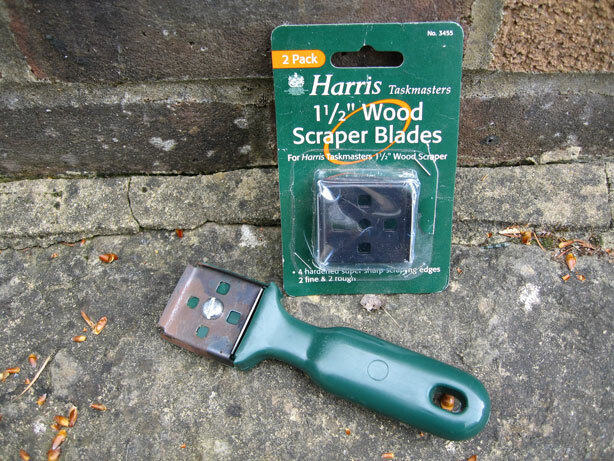 Rasp – To tidy up the ends of the wood you should use a rasp. This will give the wood a chamfered edge and remove splinters that will catch on clothing and make the table unsightly. Coming up next: How I did it. This entry was posted on Tuesday, May 2nd, 2006 at 11:06 pm	and is filed under DIY. You can follow any responses to this entry through the RSS 2.0 feed. Both comments and pings are currently closed.